Record high levels of unemployment and record low reserve funds have placed great pressure on the federal-state unemployment insurance (UI) tax and benefit system. Between 2008 and 2011, $174 billion was paid in unemployment taxes while $450 billion was paid out in benefits, a gap of $276 billion. Benefits can be drawn in some states for a maximum of 99 weeks. Over the past three years, 34 states and the U.S. Virgin Islands exhausted their unemployment insurance trust funds and have borrowed from the federal government to pay unemployment benefits. While some states have repaid their loans and others are no longer borrowing additional sums, as of May 2012, 22 states and the U.S. Virgin Islands have outstanding loan balances totaling $30.45 billion. States are not expected to repay their loans fully for several years. As a result of these outstanding federal loan balances, businesses and employees in many of these states now face increases in federal unemployment insurance tax rates. This tax is ostensibly levied at a 6.0 percent rate on the first $7,000 of each worker’s earnings, but if a state’s program meets federal guidelines, state UI taxes are credited against up to 90 percent of the federal tax. In other words, employers in a state UI program that meets federal guidelines pay a federal tax of just 0.6 percent. When a state UI program is insolvent for an extended period of time, this 90 percent credit is reduced by 0.3 percentage points per year. For example, Arizona’s UI program has been insolvent for one year, so employers in that state will see a reduction of 0.3 percentage points of their credit against federal UI tax. The federal UI tax for Arizona employers is thus 0.9 percent, rather than 0.6 percent. Of the states that exhausted their trust funds, 26 states and the U.S. Virgin Islands will see federal UI credit reductions in 2012 due to insolvency (see Table for list). Two states (Indiana and South Carolina) are in their third year of insolvency and employers there will therefore face a federal UI tax of 1.5 percent. Note: 2012 reductions assume state still has a loan balance as of November 10, 2012. Alabama did not have a loan balance on the 2011 snapshot date; South Carolina in 2011 qualified for avoidance; Michigan in 2012 has repaid its loans. These higher federal UI taxes, and higher state UI taxes enacted in many states, come at a time when private sector hiring is already at a low level and states are under significant fiscal pressure. The present method of financing the unemployment insurance system is thus exacerbating negative job growth and tax trends, instead of operating counter-cyclically as the program was intended. Indeed, states generally reduced UI taxes and expanded benefits during good economic times, and are hiking UI taxes and reducing benefits now. 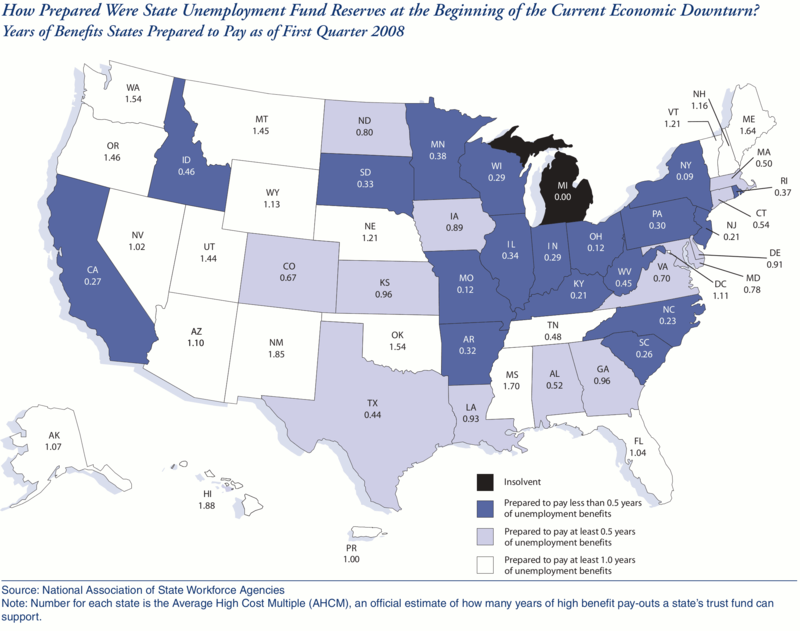 In the first quarter of 2008, just before the recession began, only 17 states, the District of Columbia, and Puerto Rico had sufficient UI reserves to pay one year of high-cost benefits. 20 states did not have sufficient reserves to even pay a half-year of benefits (see Figure). Consequently, this may be an appropriate time for the federal government and the states to contemplate significant changes to the structure of unemployment insurance taxation and benefits. Program design alternatives could offer more innovative and more sustainable methods to find jobs for the short-term and long-term unemployed while preserving benefits to support them in the meantime. These options include eliminating the firewall between administrative costs and benefits, reducing cross-subsidies through greater use of experience ratings, relying more on face-to-face training and advising, adopting elements of state workers’ compensation programs, and experimenting with individual accounts to encourage saving. These changes can enhance the program’s ultimate goal of ensuring a viable safety net for transition periods between times of employment. Our 2011 report, Unemployment Insurance Taxes: Options for Program Design and Insolvent Trust Funds, further discusses these suggestions in detail. U.S. Office of Management & Budget, The President’s Budget for Fiscal Year 2013: Historical Tables (2012), http://www.whitehouse.gov/omb/budget/Historicals. See Joseph Henchman, Unemployment Insurance Taxes: Options for Program Design and Insolvent Trust Funds, Tax Foundation Background Paper No. 61 (Oct. 2011), http://www.taxfoundation.org/publications/show/27673.html. U.S. Department of Labor, Employment and Training Administration, Trust Fund Loans, http://workforcesecurity.doleta.gov/unemploy/budget.asp#tfloans. The states with outstanding federal loans are Arizona, Arkansas, California, Colorado, Connecticut, Delaware, Florida, Georgia, Illinois, Indiana, Kentucky, Missouri, Nevada, New Jersey, New York, North Carolina, Ohio, Pennsylvania, Rhode Island, South Carolina, Vermont, and Wisconsin, as well as the U.S. Virgin Islands. See Joseph Henchman, Unemployment Insurance Taxes: Options for Program Design and Insolvent Trust Funds, Tax Foundation Background Paper No. 61, at 7 (Oct. 2011), http://www.taxfoundation.org/publications/show/27673.html. U.S. Department of Labor, Employment and Training Administration, Actual and Potential FUTA Credit Reductions, http://workforcesecurity.doleta.gov/unemploy/docs/reduced_credit_states.xls. 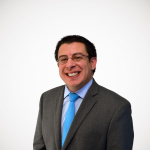 See Joseph Henchman, Unemployment Insurance Taxes: Options for Program Design and Insolvent Trust Funds, Tax Foundation Background Paper No. 61, at 16 (Oct. 2011), http://www.taxfoundation.org/publications/show/27673.html.